QUALITY:ANDY GRADE leather belt construction offers highest quality and maximum durability, they are durable and everlasting, with their beautiful finish compliments to its stylish Buckle, the womens fashion belt is elegantly designed with class to be used at any place where you need to look your best, you will always give a delusions of grandeur impression.All ANDY GRADE Row womens belts pass rigorous quality inspections ensuring only perfect belts reach the market. This leather casual belt suit waist size 26 to 35 inch , Ergonomic Desigh women belt, perfect match your waist without burden. PERFECT ACCESSORY: A good match for blouse, dress, skirt, jeans or sweater.Make your outfit look unique and classy. ABOUT"ANDY GRADE": ANDY GRADE products ONLY delivered by ANDY GRADE or FBA. Our trademark is already registered with the US Trademark Office. If you buy ANDY GRADE products from other delivery channel, ANDY GRADE disclaim any responsibility for your purchasing. There are many different product on our store. You can search ANDY GRADE on the amazon! 100% Genuine Leather : This women genuine leather belt is made of high end quality Cowhide leather and distinctive buckle, extremely soft and comfortable to wear. 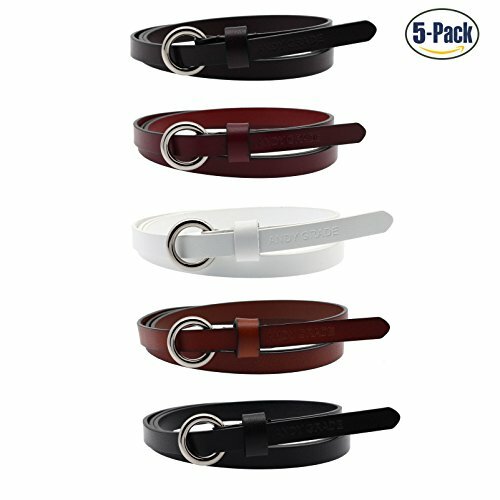 Super Affordable : 5 Pack Unmatched high quality belt for the affordable price!Forever classic colors - Black , White , Brown , Orange , Burgundy!Very nice and comfortable wearing feeling, A variety of ways to wear! Fashion wild!, suit for different occasions. SUITABLE for Most Fashion Ladies ：This Leather Belt width is 1.2 cm(0.47 inch) and length is 115 cm(45.3 inch), can suit for waist from 26-35 in！Buckle length: 2.7 cm(1.06 Inch), Buckle Width:2.7 cm(1.06 inch). Fantastic Gift Box - This designer leather belt is enclosed in a sleek and modern gift box to get a quite good gift-giving experience. Great gift for girlfriend, wife, lover, girl students and female colleagues as birthday gift or anniversary present. If you have any questions about this product by ANDY GRADE, contact us by completing and submitting the form below. If you are looking for a specif part number, please include it with your message.